The Committee On Appeal for Human Rights recognized voting as a vital tool for empowerment in the United States. Elected officials determine local, state, and national laws, policies, budget and operations that govern our lives. 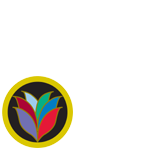 COAHR organized and participated in voter education and registration drives to increase the number of black voters. In 1961, during Atlanta’s mayoral campaign between segregationist Lester Maddox and the more liberal Ivan Allen, COAHR organized a 30-day voter registration drive. Over 5,000 African Americans registered and these increased numbers help win the election for Ivan Allen. It has been a long struggle for African Americans to gain voting rights. After the end of the Civil War, passage of the 15th Amendment to the U.S. Constitution extended voting rights to African Americans. The amendment stated that citizens’ right to vote shall not be denied or abridged on account of race, color or previous condition of servitude. Black men were allowed to vote for the first time and 16 African Americans were elected to U.S. Congress and in Georgia 31 were elected to the General Assembly. The Reconstruction period (1865 – 1877) was an effort by the U.S. government to reunite the country after the Civil War and provide some assistance to the newly freed slaves. The Reconstruction experiment failed as Southern segregationists regained power in national and state governments and enacted laws to restrict blacks from voting. 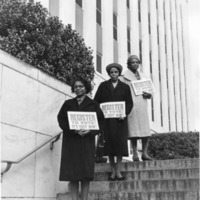 Legally elected African American legislators were ousted from office and restrictions such as poll taxes and literacy tests were implemented to keep African Americans from registering to vote. An African American was not again elected to the Georgia Assembly until 1962. 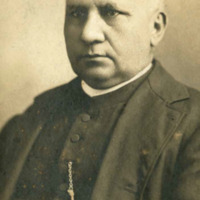 Henry McNeal Turner, Bishop in the African Methodist Episcopal Church, was elected to the Georgia legistature in 1868, but he along with other Blacks Georgians elected at this time were expelled and denied their seats. 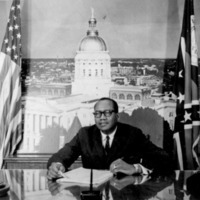 Leroy Johnson was elected in 1962, making him the first African American to serve in the Georgia Assembly since Reconstruction. 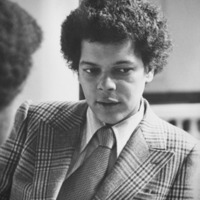 Julian Bond was elected to the Georgia legistature in 1965, but refused a seat because of his support for SNCC’s position against the Vietnam War. Upon a U.S. Supreme Court ruling he was sworn into the legislature, where he served from 1967 to 1987. In 1966, Grace Towns Hamilton became the first African American woman elected to the Georgia Assembly. 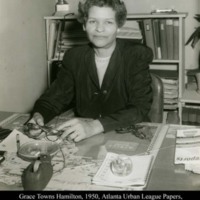 She previously served as executive director of the Atlanta Urban League from 1943-1960. 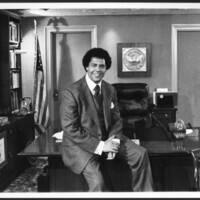 Maynard Jackson, an alumus of Morehouse College, was elected as the first African American mayor of Atlanta in 1974 and served three terms. 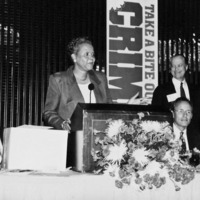 American woman elected to the Atlanta City Council and served from 1980 to 1997. 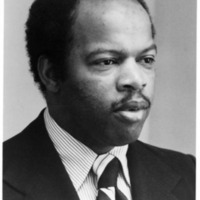 John Lewis, a former chairman of SNCC, served in the Atlanta City Council from 1981- 1986, whereupon he was elected to U.S. House of Representatives and continues to serve today. 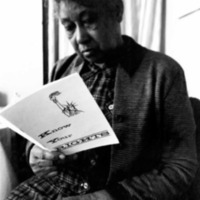 An African American woman scans through an informational pamphlet about citizens' rights. Atlantan citizens line up to register in order to vote.